With the US jumping to promote an interim agreement with Iran which weakens sanctions — probably forever — and does little or nothing to prevent Iran’s development of a nuclear weapon, many people are asking “what are the intentions of the Obama Administration in the Middle East?” The answer will be particularly important to Israelis, who see the development of an Iranian weapon as an existential threat. Israelis also wonder about US policy concerning the conflict with the Palestinian Arabs, which seems to be moving to a far more anti-Israel place than before. The idea expressed by UNSC resolution 242 and accepted by previous administrations, that secure borders need to be negotiated between the states in the area, is being replaced by the radical position that the 1949 armistice lines are the legitimate borders of the state of Israel. The administration has also studiously avoided taking a position (the Bush Administration did) against the extraordinary and unacceptable demand for a “right of return” to Israel for the descendants of Arab refugees. While it might have been possible in the past to attribute a tilt against Israel to pressure from the oil-producing Gulf states, in particular Saudi Arabia, this explanation has less force today as the US approaches energy independence. And of course the Sunni Arab regimes are even more threatened by Iran than Israel. It is also hard to explain the administration’s cooperation with Russia to ensure the maintenance of the Assad regime in Syria, and its status as an Iranian satellite, or its support for the radical Islamist Muslim Brotherhood in Egypt — something that undermined one of the bases of Israel’s regional security, the Camp David treaty. Although the army can’t be called pro-Israel, it is at least pragmatic and not interested in upsetting the status quo. So what in fact are the motives and objectives here (assuming that there is more behind our policy than ignorance and incompetence) as they affect Israel? I believe that there are two motivations here, one pragmatic and one ideological. The pragmatic aspect is that the Obama Administration has decided that Islamism and in particular revolutionary Shiite Islamism, is the strong horse in the region, and it is placing its bets on it. The expectation in Washington is that Iraq and Syria will be firmly in the Iranian column, soon followed by Lebanon. The influence of the House of Saud will be greatly diminished, and perhaps the royal family will be overthrown. In overwhelmingly Sunni nations, like Jordan and Egypt, conservative governments will be replaced by Islamist ones (this has so far proven false in Egypt, where the Islamists took power but were unable to hang on). The US considers itself at war with Al Qaeda, which is just fine with the Iranians (it fails to understand, though, that Al Qaeda, the Muslim Brotherhood and the Turkish AKP — which it supports — agree on ideology; their differences are mostly about tactics). The administration sees Iran’s nuclear weapon as a fait accompli. It thinks that it can establish a relationship with Iran that will replace the one it has with the doomed Saudis and enable it to exercise some influence in the region. Failing that, it hopes that it can appease Iran (which is already a world power in the field of terrorism) to prevent terrorist attacks against its interests and even the US itself. It has almost certainly been told by the Iranians that they will hold the US responsible for Israeli actions against Iran, and therefore considers preventing Israel from striking its nuclear facilities a top priority. Israel is diametrically opposed to most of these policies. It supports conservative Arab regimes in Jordan and Egypt. It has fought a war with Iran’s subsidiary, Hizballah, and will almost certainly fight another. It opposes the spread of Iranian revolutionary Islamism and considers an Iranian nuclear weapon unacceptable. No wonder Israel is a “key target” for US intelligence, along with China, Russia, Iran, Pakistan, and Cuba! Turning to ideology, Aaron David Miller (no Zionist ideologue!) said that “Obama really is different” from previous presidents. He has a perspective “much closer to the Palestinians than to Israel,” and it shows, in his policies and in his appointments. This is not at all surprising, given Obama’s associations and education. I think it is probably true that he accepts the Palestinian (actually KGB!) narrative of an oppressed indigenous people displaced by a colonial power — it’s certainly what he would have heard at Columbia. There is no doubt that in addition to pragmatic attitudes, there is also a belief on the part of administration officials that the moral high ground belongs to Third World nations, to ‘black and brown peoples’ who have been historically oppressed and colonized by the West. I would go so far as to say that they see Zionism as racism, and view the creation of a Jewish nation-state as a mistake. I don’t have the time and space to go into this here, but the ideology is part and parcel with the wildly inconsistent attitudes of many Americans of their generation, who seem to think that at the same time a) nothing is more important than race or ethnicity; b) racism is evil and it is racist to treat people differently in any way because of race or ethnicity; and c) some peoples have been oppressed and therefore are exempt from all of the above. The combination of what they see as realpolitik and ‘idealism’ make them profoundly unsympathetic to Israel. But I don’t they think they want to see another genocide (which in fact is the goal of many of Israel’s enemies). They do not wish for a nuclear war in the Middle East (although their policies may bring one about). The main objective of American policy toward Israel is to limit her freedom of action. To that end they want to weaken her by forcing her back to indefensible borders, to strengthen her enemies so that she will be deterred from taking action that might upset US relationships, and to make her more amenable to US pressure. In addition, they will get a warm feeling from obtaining ‘justice’ for the Palestinians. At the same time, they would like to change Israel’s nature, from a Jewish state, a nation-state of the Jewish people, to something more like the US. In the strange world of political correctness, Jews are ‘whites’ and Arabs are ‘people of color’ (tell this to an Ethiopian Jew). While they see Jewish nationalism (Zionism) as racist, they accept Palestinian nationalism as legitimate for an ‘oppressed’ people. All of this is intended to be a peaceful process. If they succeed, they will destroy Zionism as well as Israel’s ability to defend herself. She will have neither the desire to survive nor the means. In the end either the state will fade away gently, with Jewish Israelis fleeing to a new diaspora, or be destroyed in war and genocide. Israel can short-circuit this process by asserting its right to self-defense and attacking Hizballah and the Iranian nuclear facilities. The dangers inherent in doing this are obvious, but one has to weigh them in comparison to those of inaction. What is there about “Death to America” that you don’t understand? 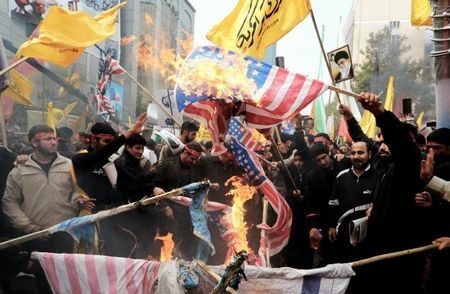 Iranians celebrate anniversary of 1979 takeover of US embassy by burning flags, shouting “Death to America” earlier this month. The US has often been criticized for supporting unsavory regimes for pragmatic reasons. Chiang Kai-shek and the Shah of Iran, for example, were not paragons of democracy and liberalism, but they were anti-communist. Remember Fulgencio Batista, Castro’s predecessor? And don’t forget that we were for Saddam Hussein before we were against him. But the Obama Administration has opened a whole new chapter. By supporting the Islamist regimes of Mohammed Morsi and Sayyid Ali Khamenei, the US helps regimes that not only oppress their own population and threaten their neighbors, but make no secret of their hatred and desire to destroy the US itself. Morsi is gone, thank goodness, but the recent agreement which rescues Iran’s economy and negates six UN Security Council resolutions against its enrichment of uranium is a shocking example of feeding — with nuclear arms — the mouth that wants to bite you. This is not just about Israel, folks. The German newspaper Die Welt reports that Iran is building missile bases in Venezuela. If true, this means that Iran would have the capability to hit the US with missiles that they already have! Even a single small nuclear bomb detonated at high altitude could do enormous damage to our national infrastructure as an EMP (electromagnetic pulse) weapon. Such a weapon could be put together in secret in a few weeks — and could even be launched from a cargo ship miles from our shore. There will not be an accommodation between Western liberalism and radical Islam because the latter wants to supplant the former, both in world leadership and in cultural supremacy. Radical Islam — unlike conservative dictatorships — is essentially expansionist, and we are in its way. The Obama Administration is mistaken in thinking that it will be possible to contain or control radical Islamist regimes with nuclear weapons by appealing to common interests like economic development and cooperation in the name of humanity. Just as we are not prepared to give up our commitment to democratic government, equality under law and some form of free enterprise (although we may differ among ourselves about the degree of control government may have over that enterprise), they are committed to the highly undemocratic and anti-equality Islamic shari’a. Iran has already invested a huge amount in its project to become a nuclear power, and it probably wouldn’t be wrong to say that today its achievement is the first priority among the objectives of the regime. It has become obvious that the present administration simply doesn’t have the will to stop them. Israel, on the other hand, understands that it will be in mortal danger from a nuclear Iran. Whether it will succeed in stopping Iran is an open question today — but it would be ironic if, at the end of the day, the fate of America should depend on Israel. U.S. President Barack Obama phoned Prime Minister Benjamin Netanyahu on Sunday, pledging future consultations with the U.S. ally on the deal. The White House announced the call while Obama was aboard Air Force One en route to Seattle for a fund-raising event. In other news, the President’s plane almost had to make an emergency landing when his pants burst into flames immediately following the call. Seriously, why would Netanyahu believe any assurances about future behavior after the way Obama deceived him about the contents of the agreement he was about to sign and the secret negotiations leading up to it? My wife recently had my grandson write an essay about telling the truth. Maybe a similar exercise would be educational for the President? It is very important to tell the truth. If you don’t, then nobody will ever believe you or trust you. You will not have friends. For example, I told my friend Bibi that I wouldn’t weaken sanctions on Iran unless it agreed to stop enriching uranium. But meanwhile, I was secretly promising Iran that I would do just that! And then I did it. Now Bibi doesn’t want to be my friend anymore. Can you blame him? 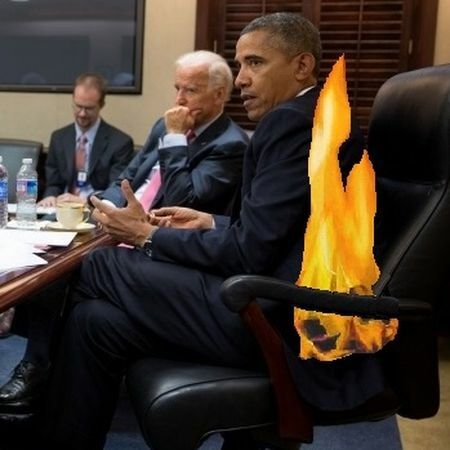 I also told my other friends, the Arabs, that I wouldn’t allow Iran to get a nuclear weapon. But my deal gives them the time and money to do it. And I even said that the military option is still on the table! Well, that was a whopper! There is no way I will be the one to start a new war in the Middle East, even if that means I have to let Iran be the one to start it. But Bibi and the Arabs figured this out and now they are mad at me. But I couldn’t help myself. It is really important for me to make it look like my policy of appeasement engagement is a success. I needed something positive after totally screwing up our relationship with Egypt, and then flip-flopping so embarrassingly on Syria. And of course the Republicans haven’t stopped busting my balls about the mess in Benghazi. I had to keep Bibi and the Arabs from spoiling my plan to be a successful peacemaker. So I’m really, really sorry I got caught lying lied to Bibi and the Arabs. But I got the Nobel Peace Prize in advance for being so good at peace, didn’t I? And now I’m going to show the world how good I am at peace by fixing up Bibi and the Palestinians! I just hope I don’t get caught again. Netanyahu has also said that Israel does not consider itself bound by the agreement. Israel was not a party to it (as Czechoslovakia was not a party to the Munich pact), and what he means is that Israel reserves the right to take action if Iran appears to be about to obtain nuclear capability. This is strong talk, but quite sincere. Israel is not interested in further damaging its relationship with the US, and there is no reason for it to oppose the agreement other than the belief that it will bring Iran closer to achieving its goal. My guess is that the 6-month period of the interim agreement will not elapse without either Iran obtaining weapons capability, or Israel striking its nuclear facilities — despite the near-universal international condemnation this will evoke. If Israel does hit Iran, many of her traditional enemies — the Sunni Arab bloc — will be pleased as punch. Of course, they won’t express their joy publicly nor will they become more reconciled to Israel’s continued existence, once the head is off the (Iranian) snake. The United States and Iran secretly engaged in a series of high-level, face-to-face talks over the past year, in a high-stakes diplomatic gamble by the Obama administration that paved the way for the historic deal sealed early Sunday in Geneva aimed at slowing Tehran’s nuclear program, The Associated Press has learned. As negotiators continued to talk behind the scenes, public speculation swirled over a possible meeting between Obama and Rouhani on the sidelines of the U.N. General Assembly, which both attended in September in New York. Burns and Sullivan sought to arrange face-to-face talks, but the meeting never happened largely due to Iranian concerns, the officials said. Two days later, though, Obama and Rouhani spoke by phone — the first direct contact between a U.S. and Iranian leader in more than 30 years. It was only after that Obama-Rouhani phone call that the U.S. began informing allies of the secret talks with Iran, the U.S. officials said. Obama handled the most sensitive conversation himself, briefing Israeli Prime Minister Benjamin Netanyahu during a Sept. 30 meeting at the White House. He informed Netanyahu only about the two summer meetings, not the March talks, in keeping with the White House’s promise only to tell allies about any discussions with Iran that were substantive. In other words, the Obama Administration negotiated secretly for months with the regime that has called for the destruction of Israel countless times, and whose supreme leader recently called Israel “the rabid dog of the region” and said that Israelis “should not be called humans.” Obama informed his “ally” about it only two months before signing an agreement — an agreement that Israel believes sets the stage for Iran to threaten its existence. Either the administration thinks the Israelis are wrong about the danger from Iran, or it doesn’t care. Secretary of State Kerry reportedly told members of the Senate Banking Committee to “stop listening to the Israelis on this.” And the White House recently claimed that the alternative to its deal will be a “march to war.” What they don’t say is that the result of appeasement is often also war, just war on worse terms. I am going with “doesn’t care.” I’ve come to the conclusion that the administration believes that it is impossible to stop Iran — except by military means, which are off the table (despite what they say publicly) — and that it is possible to live with a nuclear Iran in the new ‘friendly’ atmosphere that they believe they have created by appeasing it. From the start, President Obama and his advisers, almost to a man (or woman), have been unsympathetic to the idea of a Jewish state and to Israel in particular. Israel is, for them, if not an enemy at least an obstacle. While you can deceive an enemy or obstacle, you can’t betray it. Betrayal is something that happens between friends or partners. And this administration has finally made it 100% clear that there is no such relationship. Here is a good, short explanation of what is good and (mostly) bad about the deal. And here is an official statement from the Israeli Foreign Ministry. Finally, here is a longer, 2-part discussion by J. E. Dyer, a retired Naval Intelligence officer. Jonathan Haidt, in his excellent book The Righteous Mind: Why Good People Are Divided by Politics and Religion, argues that we are motivated by emotions, not reasoning. Logic can rationalize our beliefs (and the actions we take) afterwards, but emotions drive us. Even the facts that we use to rationalize our feeling-driven conclusions are perceived, remembered and given weight selectively, through an emotional filter. So if you want to persuade someone of something, start with the emotions. Facts and logic can wait. I often wonder if the journalists of the anti-Israel media like NPR and the NY Times do this out of conscious intent or instinctively. Both focus strongly on the emotional aspects of the conflict. While there may be ‘balance’ in the facts presented, the weight of emotional content is always on the side of the Arabs. Do they have meetings in which the editors explain the best propaganda techniques? Or are they expected to have learned this stuff in Journalism school? Recently the NY Times embarrassed itself by going more than a little over the line in this direction when it published a story about the gruesome knife murder of a sleeping 19-year old Jewish soldier, Eden Atias (my take on the murder is here), illustrated with a photo of the grieving mother of the murderer! The article, which devotes more space to Israeli plans to construct homes outside of the Green Line than it does to Arab terrorism, incitement and murder, is bad enough — but the photo provoked a storm of complaints to Margaret Sullivan, the Times’ public editor, who responded with a rare admission that the Times had made a “wrong choice” in selecting it to illustrate the story. [Ms Sullivan] spoke on Monday afternoon to two senior editors at The Times. Both agreed that the photo was a regrettable choice. The dominant image with an article should reflect the overall point of the article and the reason for its newsworthiness. “This did not represent the essence of the story, which was clearly the moment of the Israeli soldier being stabbed,” said Michele McNally, the assistant managing editor in charge of photography. She said a less-senior picture editor chose the photograph, along with one representing what she considered the other side of the story, which showed an Israeli police officer at the crime scene. The selection of the Palestinian mother’s image with the article was an effort to achieve balance, but such an effort was not appropriate in this case, Ms. McNally said. In the print editions of the newspaper, the two photographs were published on an inside page with the Palestinian photograph above the other. On the website and in other digital presentations, the Palestinian photograph was by far the more dominant image and remains so. It was only later in the news cycle that photographs of the soldier’s funeral — which would have been an appropriate choice for a dominant image — became available, she said. (A photograph of the victim would also have been appropriate, she said.) “We should have waited for that or substituted it once it came,” she said. Were there no photos of the crime scene or of Eden Atias available immediately after the murder? Funny — all the Israeli newspapers had them. 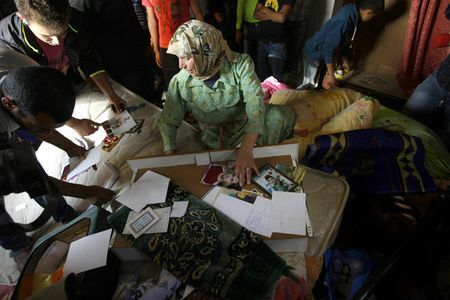 How is it that the carefully composed picture of the murderer’s mother, which could only have been taken hours after the murder and the arrest (by Palestinian Gonzo photographer Muhammad Ballas), was available to them early and these others were not? And why didn’t they substitute another picture? Stupid or evil: you decide.